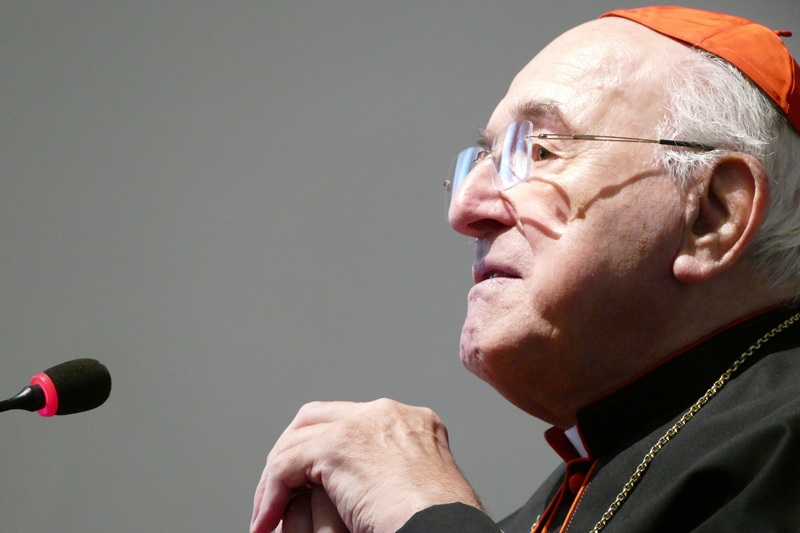 Voice of the Family’s conference, Humanae Vitae at 50: Setting the Context, was opened this morning by His Eminence Walter Cardinal Brandmüller. His Eminence is one of four cardinals who submitted dubia to Pope Francis, in September 2016, calling for clarification of the doctrine of Amoris Laetitia. His Eminence used his brief opening remarks to recall the authoritative nature of the Church’s teaching on contraception and to warn against false theories of doctrinal development. We are grateful for his presence and his witness. During the coming days Voice of the Family will be bringing you the full text of all the addresses delivered at the conference. The event which we are here to recall today is the publication by Blessed Pope Paul VI of the Encyclical Humanae Vitae on 25 July 1968. Among other things, in this encyclical Paul VI put an end, in doctrinal terms, to disputations pursued with great fervour even within the Catholic Church on the lawfulness and moral reprehensibility of artificial contraception. The encyclical therefore triggered a fierce storm of protest within the Church. The matter became a subject of controversy in the Catholic world when, at the 1930 Lambeth Conference, the Church of England reached a decision, based on a vote of 193 in favour and 67 votes against, entirely in keeping with the secular spirit of the time, in favour of contraception, thereby becoming an influential opinion-leader in the non-Catholic world. The Encyclical of Pius XI, Casti connubii, published on 31 December 1930, which presented the Catholic position with great clarity, met with an impressive ecumenical consensus. “The majority of Protestant Churches regard contraception and periodic abstinence as morally justified if the motives are just. It is generally believed by Protestants that the motives, rather than the methods, constitute the principal moral problem, providing that the methods are limited to the prevention of conception. Protestant Christians are in agreement in condemning abortion and any method which destroys human life, unless the health or life of the mother is at risk”. It could not be ignored that this declaration was based on the concept of situational ethics and would otherwise penetrate Catholic moral theology. These, in broad terms, were therefore the circumstances under which the Second Vatican Council was obliged to tackle the matter of contraception. During the debates, Catholic voices were raised in the Council chamber calling for endorsement of the American Protestant position described above. We also recall in this regard the warning from Cardinal Suenens, issued with terrible pathos to the Council fathers, that the Church should not, for the love of God, create a new Galileo case, by once again opposing the discoveries of modern science through its refusal of contraception, an utterance which certainly failed to demonstrate any great knowledge of the Galileo affair. Today however, we are confronted with the results of a process initiated at the 1930 Lambeth Conference which, from the approval of artificial contraception, has led us to the monstrosity of what is today known as procreative medicine, by which man has seated himself on the throne of the Creator. It is therefore in the context of these circumstances that tribute should be paid to the Encyclical Humanae Vitae published in 1968, a doctrinal document whose prophetic nature has, over time, also been acknowledged by leading non-catholic thinkers. In this encyclical, Paul VI brought temporary closure to a series of doctrinal affirmations on the matter of contraception, instigated by Pius XI in Casti Connubii and continued by Pius XII and John XXIII. These were ultimately taken up, developed and deepened by John Paul II. Humanae Vitae provides an extraordinary example of the workings of the process of parodosis, which means transmission of the doctrine of the Church. When the truth of faith is received, adopted and transmitted, what happens is that what is received, when adopted and transmitted, responds with deeper understanding and more precise expression to the needs of the respective present, while continuing to be identical to itself. In all of this, contradiction between yesterday and today is impossible: it is the Holy Spirit who acts in the Church of Jesus Christ to guide this process of paradosis. It is the Holy Spirit who ensures that the faith of the Church develops in the course of time, just as an adult person continues to be identical to the infant it was in the past, an intuition formulated by Vincent of Lérins as early as 430 and elaborated upon by Blessed John Henry Newman. The Conference today inaugurated has been called for this renewed reception, adoption and more profound transmission of the truly prophetic teaching of Paul VI in the year 2017. May this extraordinary secular document of the Petrine Magisterium again irradiate the splendor veritatis, capable of illuminating the current darkness of minds and hearts. Lumen Christi gloriose resurgentis dissipet tenebras cordis et mentis. I pray that God will bless your work and hope for a successful outcome of this Conference.